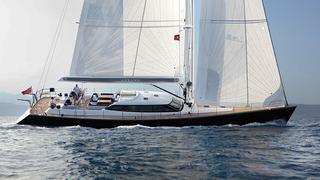 Northrop & Johnson send word that Hank Halsted has signed for sale the 24.9m sailing Two. Built in expoxy resin by Turkish yard Alia Yachts to a design by New Zealand naval architect Alan Warwick, superyacht Two was delivered in 2012. Designed as a fast and easily handled world voyager, she has all the amenities for comfortable living in port or out to sea. The layout offers a full width master stateroom aft with two en suite guest staterooms and a low profile raised pilothouse with 360 degree views. There is also a convertible library/fourth stateroom forward of the saloon. Sail handling is fully automatic with hydraulic in-boom and headsail furling, power winches, plus bow and stern thrusters, meaning she could easily be run by an experienced couple. Further, her retractable lift keel offers access to ports normally inaccessible to yachts with her performance capabilities. Lying in Newport, Rhode Island, Two is asking $4.7 million.